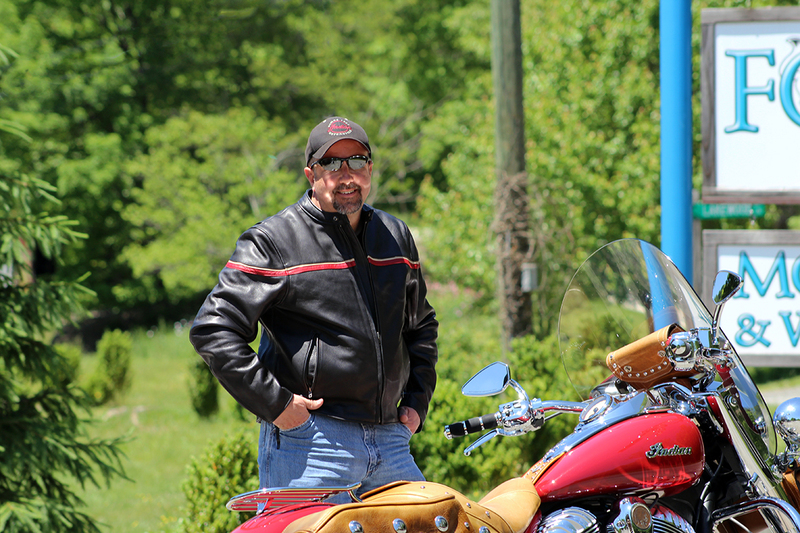 A frequent customer of ours, Barry Campbell, enjoys taking trips up to see us at Fox Creek Leather. One of his most recent purchases was the new Striped Racing Jacket. Below are his thoughts on that jacket. 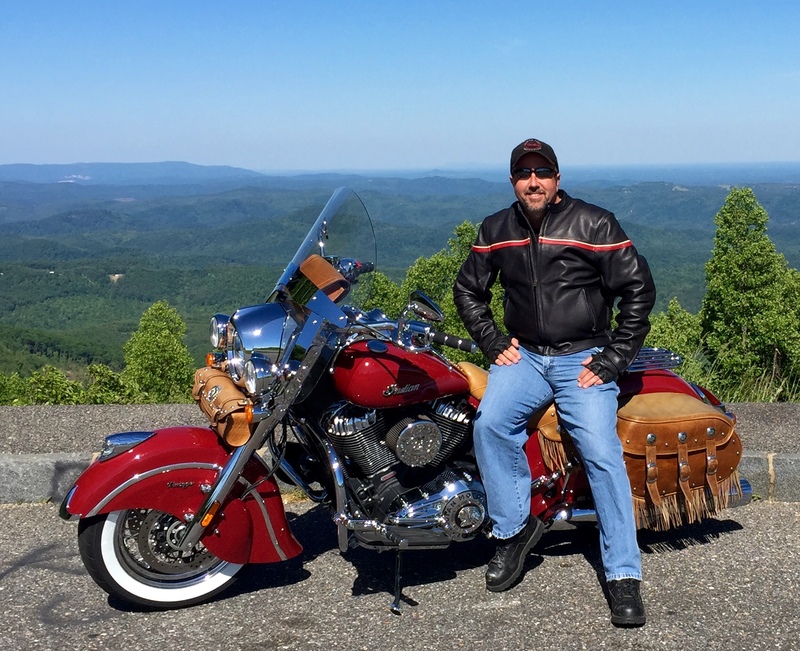 “Earlier this year, I rode my bike up to Fox Creek Leather to pick up a custom vest I had ordered. While there, I had to look at this jacket that I had seen on their website only a few days earlier. The first thing that drew me to the jacket was the appearance. You’ll never go wrong with a black leather jacket, but the little bit of color from the red and beige stripes really adds a classy touch without going overboard. It looks great! The quality of the jacket is what I’ve come to expect from Fox Creek Leather; you can’t beat it! It’s a solid jacket, but without being overly heavy which is what I wanted. I was looking for something with a little different style and maybe a little lighter than my other leather jacket and I found that in this one. The stitching, the snaps, zippers; everything is of the highest quality. The leather is thick but still retains a supple quality to it that allows for the jacket to be very comfortable when wearing it. I love the features of this jacket. The zip out liner has full sleeves and a built in neck warmer that stays out of sight, tucked between the liner and the jacket itself when not in use or it can be easily removed. Although I haven’t had the opportunity to use it, I like the idea of knowing that it’s there when the temperature drops. There’s four vents; two on the back and one under each arm. I really like the fact that you have a zipper on each side that allows the jacket to expand if needed. You have two large inside pockets with the one on the left being a leather lined gun pocket. Leather lined! It’s like having a holster on your side that’s easily big enough for a mid-sized .45. Trust me! This jacket is listed as an all season jacket. I decided to wear my jacket to work one day last week with the temperature being in the low to mid 80’s when I left shortly after lunch. With the liner, it was entirely too warm for me; which I expected. I removed the liner at my friend’s house before we rode on in to work. With the vents open, I found it to be comfortable as long as we were moving. Keep in mind, I’m not one to wear a jacket in the summer and anything in the 80’s is still hot to me. But for those that choose to wear a jacket anytime they ride, I believe they would find this one comfortable. On the ride back home that night, the temperature had dropped to mid 60’s and I found the jacket very comfortable without the liner and the vents closed. The temperature was in the 60’s again this past Saturday when I left Mooresvile to ride up to Fox Creek for their customer appreciation ride and again found it very comfortable to wear on the bike.